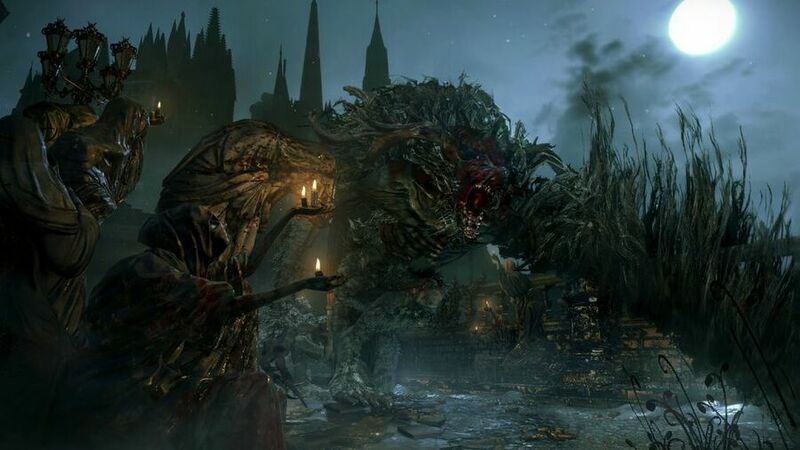 And so it begins: the Cleric Beast is the first major boss that you'll encounter in Bloodborne, and also the protector of a nice Bronze Trophy and the Sword Hunter Badge. Despite its ample size and claustrophobic stomping grounds, however, it is very beatable – well, as long as you have the right strategy. While it may sound counter-intuitive, you're best off staying close to the Cleric Beast, as attack from distance and it will attempt to leap on top of you. Should you find yourself on the receiving end of one of these jump strikes, dodge just after the nasty has left the ground, and you should escape undamaged. Your best bet, though, is to get in behind it. Guide: Which Origins Class Should You Select in Bloodborne on PS4? Once you're in at the rear of the foe, you'll have the upper-hand, as you'll be able to target its legs and do some serious damage. Don't worry too much if you get hit, as a quick counter attack will enable you to regain many of your health points. A swift, one-handed weapon definitely works best here, but you'll obviously have to work with what you've got. There are occasions where the Cleric Beast will become enraged, in which case you're going to want to steer clear of its pounding and swiping attacks. It's also worth noting that the foe can pick you up should you position yourself directly in front of it, and it will punish you once it's in control. As such, you're better off trying to move as much as possible, getting behind it as often as you can. Molotov cocktails will do decent damage if you're looking for a little assist, but keep pounding away on the enemy's hind legs and moving about and you should bring it down eventually. Once you're done, enjoy your shiny new Bronze Trophy – and mentally prepare yourself, because it's going to get much harder than this. Have you managed to kill the Cleric Beast yet? Have you got any tips for defeating it? Cut the nasty down in the comments section below. This feeling...this is what I missed the last year on the PS4. The anticipation for a new game, checking your mailbox every 30 minutes if the game already shipped, thinking bout cancelling it and using your lunchbreak to buy one from the most expensive retailer around so you at least have the game in your hands! This is such a wonderful feeling and exactly why I am so passionate about this crazy lil hobby of ours. I was worried bout the framerate, the loading times are way too long...but love is blind as they say and from the first footage I've seen from this game I knew it was "the one". I feel sorry for most other games that will come out this year, because I have the feeling that this won't be topped. The only games that might challenge Bloodborne are Persona, Xenoblade and Zelda, with the latter probably not seeing the light of day in 2015. From has delivered again and I'm glad there are still games that despite their minor flaws can get everyone so exited. And although I usually play alone, this is such a social game with me texting my brothers, friends and colleagues and they doing the same, exchanging war stories and tips and tricks. Have fun y'all!! Did itwarlier in the evening at fourth trial... one of the best moment in my videogamer life. Strangely enough I ran into him after I took down the g man and was just farming before entering the Cathedral. Had no problems with the cleric, but earlier in the game I may have hated my life. This game. Man is it good. Played till 4am last night, then from 3:30 or so till now and didn't even notice it. I died... A lot. Including a particularly brutal time when I was hammering the g man for a few hours while level 12-13. Didn't realize so much of this game until 6 or 7 tonight because I refused to read anything. Read a quick top 15 tips and it made all the difference between ramming my head against a brick wall, and a slightly more forgivable 2 by 4. @Sanquine You won't regret any single penny! @get2sammyb thanks Sammy! I do not clearly understand what to do with the drop of the Clergy, and i already met Gascoigne (is it how Paul will end up keep drinkin'? ). Am i missing something? Stay behind the beast, and always dodge to the left of him (the beast's right weaker hand) as he will miss you more often on that side I think. How far is the Cleric Beast from the starting area? @Quorthon About 10-15 minutes way if you take your time. You should see 2 werewolves near the entrance towards the boss fight just past the gate were you see a larger enemy with a brick. I would like to note, that if you never find the cleric boss, and end up getting to Father Gascoigne, and you die, you'll spawn in the Hunters Dream with the doll awoken. So you can level up before the cleric boss if you do it that route. I was looking for the cleric boss and the bridge to fight it, i saw two werewolf's and i couldn't beat them so i thought that wasn't the right way. So i kept looking and found Father Gascoigne and got whooped. Lol. Killed him first go!!! Thought I was a souls God!!! Then proceeded to get annihilated by father G and realised I got lucky! !